Laugharne Castle (Cadw) CastleThink Laugharne, think Dylan Thomas. A bittersweet love affair between townsfolk and resident poet, conducted via prickly poems and supremely clever short stories. Think Laugharne, think castle too. The magnificent medieval castle turned Tudor mansion later became the perfect antidote to writer’s block. Both Dylan and author Richard Hughes put pen to paper in the castle’s garden summerhouse. Looking out over the estuary, like an eagle nesting on its eyrie, this impressive relic of ancient times demands you stand and stare. It will simply take your breath away. ‘Brown as owls’ as Mr Thomas put it so eloquently in his ‘Poem in October’. Built in the 13th century by the de Brian family, probably atop an earlier Norman ringwork castle, the solid mansion we see before us is the lasting legacy of Sir John Perrot. It didn’t fare too well during the Civil War. Once captured by Parliamentary forces after a siege, it was partially dismantled. 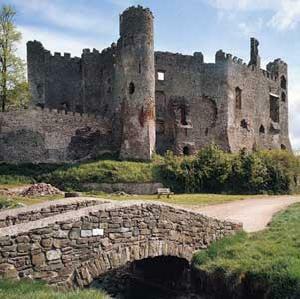 Laugharne Castle is a castle in the town of Laugharne in southern Carmarthenshire. It is located on the estuary of the River Tâf. Medieval in origin, it was later transformed into a fine Elizabethan mansion. From the A40, take the A4066 to St Clears and continue on this road to Laugharne; through the town, pass the Castle on left and continue to car park on left. Bus: 100m/110 yards, route No 222, Carmarthen-Laugharne/Pendine. Bike: NCN Route No.4 (300m/330 yards).